Semi-soft, two panel design for head, shoulder and neck comfort support. 7 heavy duty suction cups for firmly anti-slip. 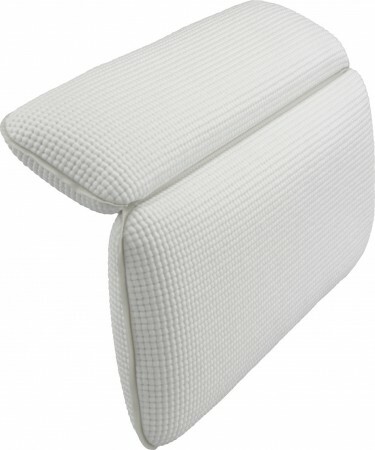 Angular curve cushion for extra comfort , best for any bath tub, spa, or jacuzzi. Waterproof, easy to clean, repels water and quick dry. Surpahs' 100% satisfaction guarantee, 100% worry-free guarantee. Relax with the Surpahs luxury comfortable non-slip suction cups spa bath pillow, Semi-soft and large, two panel design for head, shoulder and neck support. Chemical and odor resistant for easy maintenance. As online shopping with Amazon you don't actually see and touch the product, Amazon's A-Z claim policy will protect your shopping, beyond this, you are also backed by Surpahs' 100% satisfaction guarantee policy. Your online shopping is 100% worry-free guaranteed!